The big day is here. The moment you’ve been waiting for since the middle of 2016. It was a LONG, stressful day on the dyno, but the work has paid off. Not only did I make more power than I was expecting, but I did it with less boost, and couldn’t ask for a better powerband. This thing is an absolute riot (a bit scary, I’ll admit it) and I can’t wait to post up some fun adventures in a 400+hp Miata. Complete motor/drivetrain build list here: VVT MEGA PAGE. I will be making a more comprehensive version of that with build cost… soon. First up, the overlay of the final 91 octane pull vs. the final E85 pull. See the 300wtq @ 3600RPM? That’s the “canyon power” I’m always talking about. Life’s too short to wait for power. Notes: Cutout open on both pulls. 91 octane boost level was 16.5psi at 3500, taper to 17.5psi at redline. 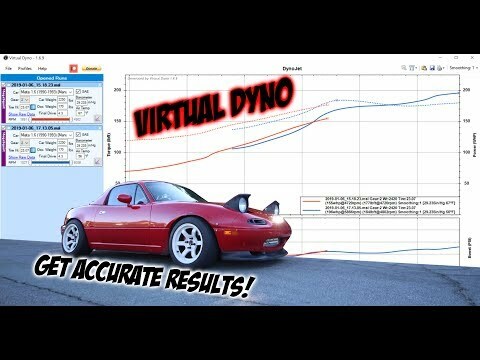 Boost control still needs a little work, as Dynojets simulate less load than say, an actual 5th gear pull on the street. So in real conditions, the boost comes on sooner, but does need to be fine tuned because of that. 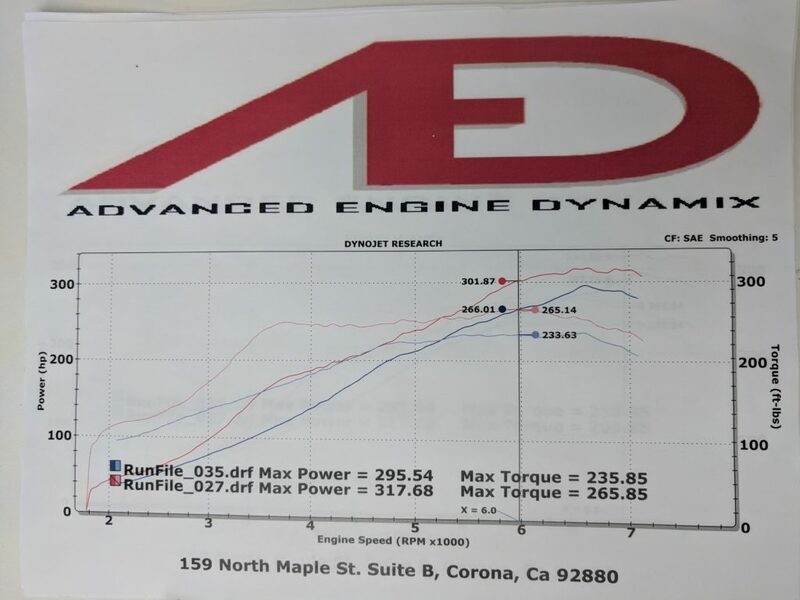 E85 pull was 19psi @ 3700, 21psi by redline. Optimally I’ll have it tuned to reach the full 21psi at initial spool up yielding even more torque down low (as if I need more). Also – VVT was not coming on until 3500RPM, and I think running 10w40 is going to help with that over my 5w30. I believe spool-up will be improved as well, because right when VVT would come on, the boost would jump up really fast. I’ll have an update on that as I get a little more street tuning time in. 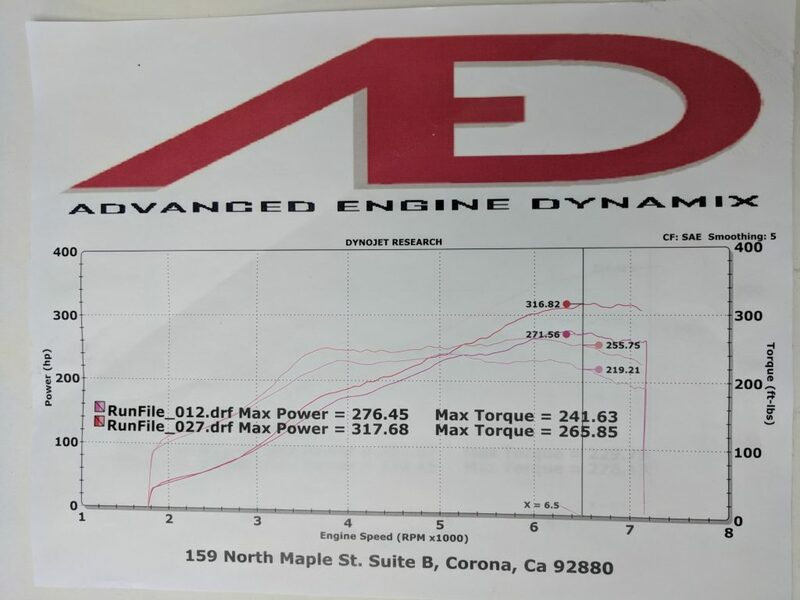 Here’s an overlay of my old 1.6L on E85 with the billet compressor wheel GT2554R at 15-16psi (pink), against the EFR, 91 octane at roughly 16.5psi peak (red). Very similar powerband, faster spool surely aided by the larger displacement, but still super impressive considering the GT2554R was pretty much out of air, while the EFR has a ton of headroom left at this power. 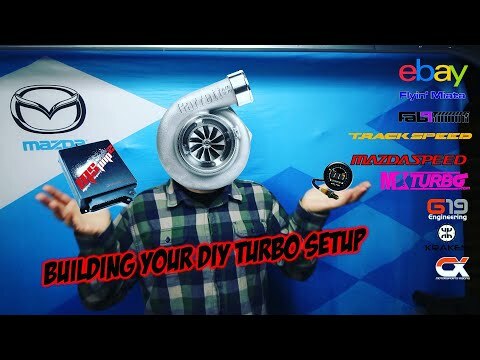 So for anyone considering this turbo for a 220whp build, I’d still recommend it. That peak horsepower number isn’t everything. Here’s a comparison that clearly demonstrates it. The 1.6L with the big GT2860RS strapped on pushing 18psi, against the current 1.9L’s EFR/91 octane 16.5psi pull. Both making “respectable numbers” only differing by 22whp at peak. But I’ll let you guess which one feels faster and is more fun to drive. 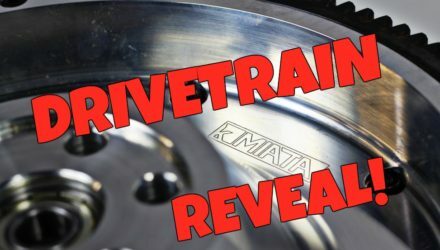 Hint – it’s the one that makes 90wtq more at 3500rpm. 90wtq. 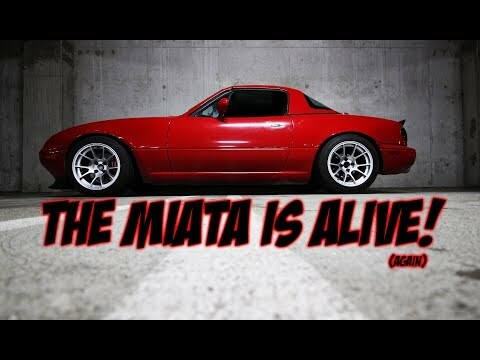 That’s more than a stock 1.6L Miata. And the funny thing is, the old laggy GT2860RS would struggle to make over 320whp. One day you guys will believe me when I say turbo selection is important! 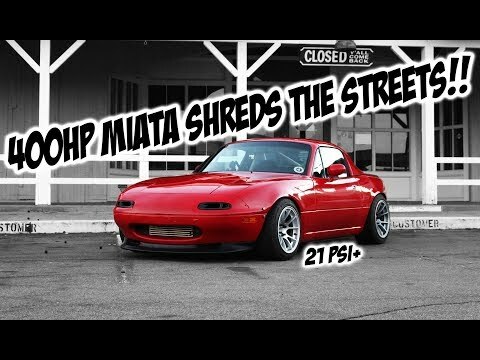 To really put things into perspective: Green is a bone stock 1.6L Miata (Broke & Boosted initial pull) at 94whp. Red is the first pull I ever made on my turbo Miata, “Churbo” powered at 10psi running pig rich on a base ignition map. A whopping 174whp, which felt incredibly powerful to me at the time. 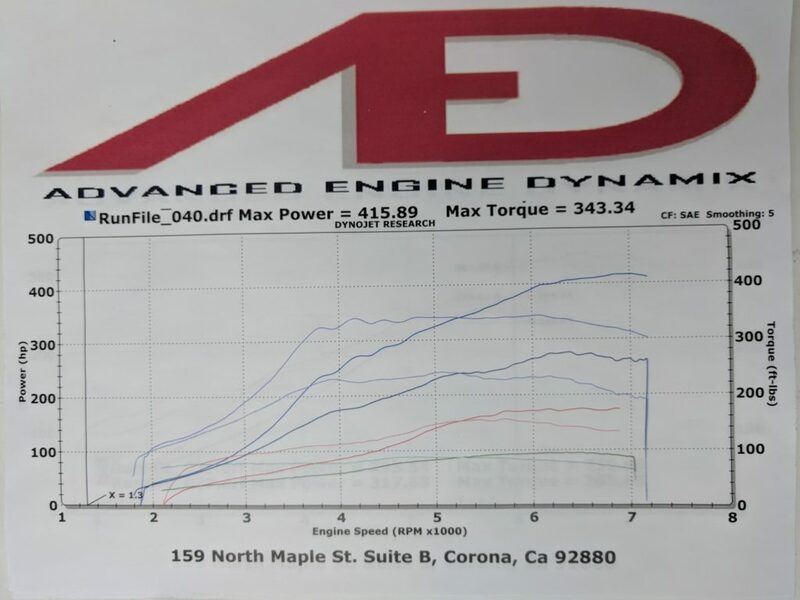 Dark blue is the 276whp GT2554R E85 1.6L setup. 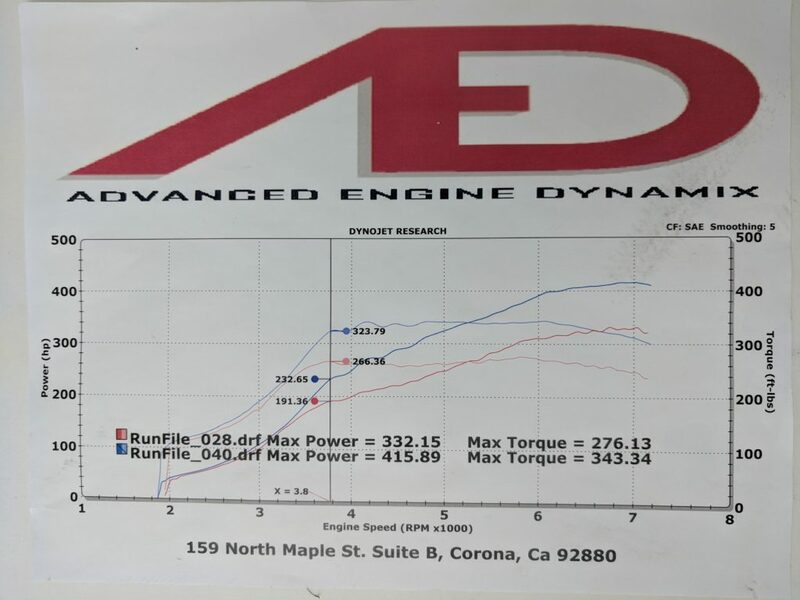 Clearly eclipsed by the current 1.9L EFR6258 E85 setup at 415whp.